The term “cultivated wild rice” is an oxymoron, but while a few wild harvest operations in Minnesota sell their rice online outside the state, if you’ve eaten any of this long, purple-black, chewy grain lately, it probably came from a farm, in either Minnesota or California. In Maine, its history as a foodstuff is not so clear, but every Wabanaki language that was spoken at one time in the state has a word for wild rice, according to Cathy Pollard-Ranco, a staff member at the Massachusetts-based Gedakina Inc., a Native American Experiential Outdoor Education and Leadership Development organization. At a recent Maine Fare event on efforts to restore indigenous foodways in the Northeast, she brought up that linguistic fact as proof that native people in Maine had access to abundant wild rice before logging, milling and development affected both wild rice’s riverbed habitat and human access to it. She spoke at the Museums of the Bethel Historical Society. Wild rice plants – technically an aquatic grass seed – grow in shallow water on the edges of small lakes and slow-flowing streams. Only the flowering head rises above the water. Northern Wild Rice (Zizania palustris), an annual, still grows along the Kennebec River, its tributaries and estuaries. It serves primarily as food for water fowl and other migratory birds, as well as other aquatic life. Traditionally, harvesting wild rice was a two-person job involving a canoe and a pair of wooden sticks called flails. One person uses a long pole to paddle or push the canoe through the rice beds. The other uses the flails to pull the rice stalks over the canoe’s gunwale with one stick and gently knock the rice off the stalks with the other. Most of the mature grains fall into the boat; the less mature grains on the lower end of the stalk stay attached. This process ensures that enough mature rice goes back into the water to generate the next year’s crop, and it leaves enough on the stalk for hungry wildlife. Last September, Gedakina teamed up with the Maine Primitive Skills School in Augusta to enable a group of local Native American women to learn how to process some of the wild rice harvested by the school’s interns. 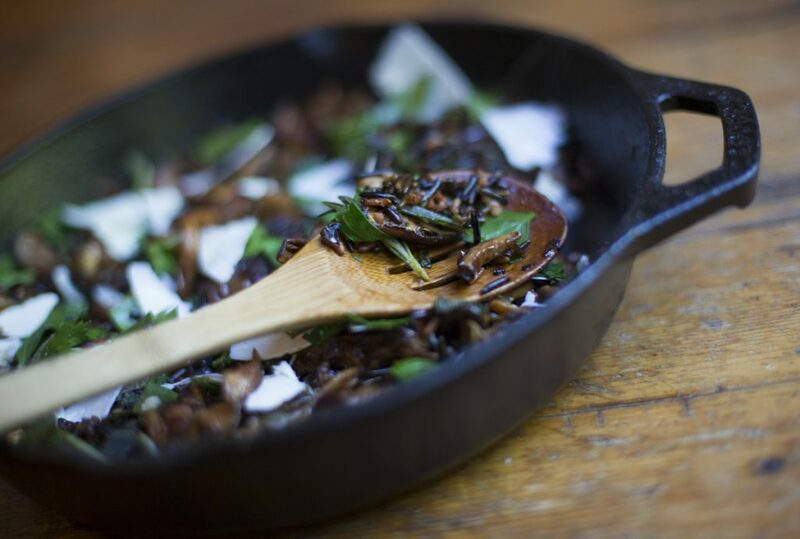 Traditionally, wild rice was dried in the sun, then parched over a wood fire to reduce its water content so that the grain pulls back from its inedible hull. Next, it was placed in deep, open baskets and people donned moccasins and danced on the rice to force the kernels from the hulls. The rice was winnowed in a birchbark tray to separate the grain from the chaff.